This report is a follow-up of the visit to the Shri Guru Ravidas Temple, located on 8205 DuRocher. The Gurdwara is fairly new, having been started four years ago in 1997. However, they have only been at the current address for the last four months. 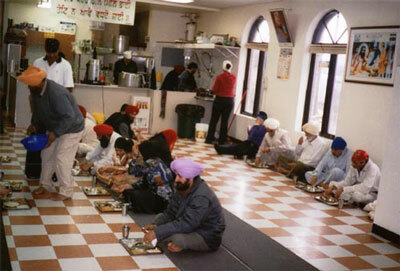 As is common, the Gurdwara is open every day of the week from five-thirty in the morning until ten o'clock at night. The congregation has about four hundred members, many of whom are new immigrants. There are considerably more men who visit the temple than women; the day of our census the ratio of men to women was five to three. There are also very few young adults, the data we collected showed that for every three people in the fifteen to twenty-one age category, there were seventeen adults. The majority of the congregation are immigrants, with five first-generation immigrants for every four Canadian born members. They also tend to be fairly new immigrants; for every two immigrants who have been in Canada more than five years, there are three who have been in Canada less than five years. When one enters the Gurdwara, it is expected that you will take off your shoes and socks and cover your head. 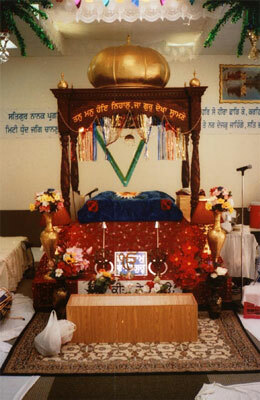 This is done as a sign of respect for the Guru Granth Sahib, and is a practice common to all Gurdwaras. There is also opportunity to wash your hands, and in some Gurdwaras (though I did not notice this in the one I visited) there is also a place to wash your feet. The name Gurdwara, which was given by Guru Hargobind, means "the gateway through which the Guru can be reached". When one enters the Gurdwara, it is believed that you are entering the presence of the Guru. Both men and women have the opportunity to participate in the service. Sikhs are unique in their use of music in the services. The Guru Granth Sahib, the Sikh scripture, is largely composed of verses which can be sung. There are a total of sixty-one raags, or arrangements, which are used in the singing. Many of these raags were written by the Gurus themselves, who were quite musically inclined. The official singers of the ragas are called the Ragis. The title Ragi has been traced back to the fifth Guru, Sri Guru Arjun Dev, by the Sikh musician scholar Professor Kartan Singh. The Guru encouraged his Sikhs to learn music and gave them the name Ragis, while Muslim singers were called Rababis'. At the Shri Guru Ravidas Temple the hymn singing, which is called the kirtan, is preformed by the Ragis. Ragis must undergo extensive training in order to be able to sing the raags properly. The instruments used in Sikh worship can be divided into four categories; stroke, bow, lute and percussion. At the Shri Guru Ravidas Temple, the instruments used are the Vaaga (a harmonium) and the tabla (the drums). 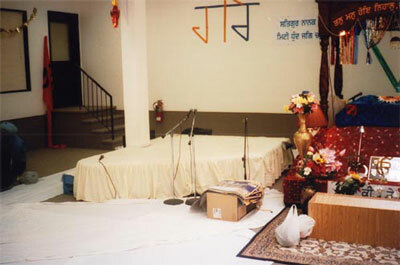 It should be noted that the singing of the raags by other members of the Gurdwara is not prohibited. Most members, however, prefer to listen and contemplate the meaning of the verses. At the Shri Guru Ravidas Temple the Granthi is responsible for the reading of the Guru Granth Sahib, which takes place at the end of the service. Any man or woman can be a Granthi, which is a title indicating that the person is proficient in the reading of the Guru Granth Sahib. It is important to note that a Granthi is not the equivalent of a priest, as Sikhism does not have priests. 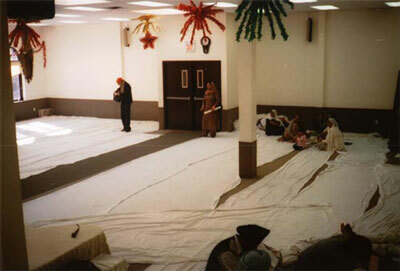 The Granthi is also responsible for the distribution of the Ardas, or the final group prayer. It is proper to remain seated for most of the service, but during the reading of the Ardas it is respectful to stand and face the Guru Granth Sahib. A special part of the service unique to the Sikh tradition is the distribution of the Parshad, or holy sweet. The Parshad is considered a gift given to the congregation on behalf of the Guru. It is prepared with equal parts wheat flour, sugar and butter, making it easy to prepare and distribute. The Parshad is distributed equally, without discrimination or favour. It would be easy for observers to think that a bowl of Parshad is offered to the Guru Granth Sahib. This is, in fact, not the case; a bowl of Parshad is placed by the Guru Granth Sahib but is actually intended for the Granthi, who is busy attending to the Scripture. At the Shri Guru Ravidas Temple, the Sevadars distribute the Parshad. 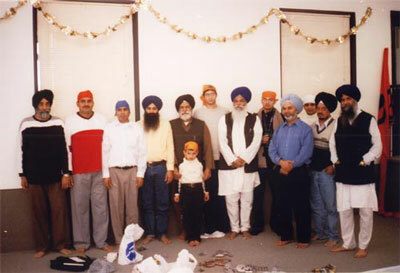 The Sevadars are members of the Sangat, which is the Sikh term for congregation. The facility, as shown in the pictures, is fairly large and can seat roughly 400 people. 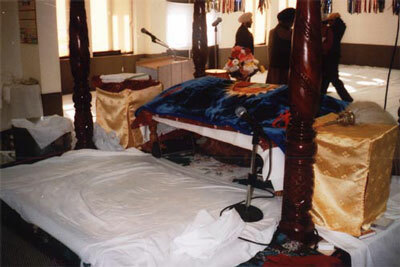 The seating arrangements are made with women to the left of the Guru Granth Sahib and men to the right. Children can sit on either side but tend to sit with their mothers, if they stay in the prayer hall. As everyone sits on the floor there are no chairs, but the Guru Granth Sahib is kept on a table with a canopy on top of it. It is a sign of respect to the Guru to bow to the Scripture when you enter or leave the prayer hall. It is not necessary to separate males and females for religious reasons, but as people sit very close together many feel that keeping the sexes separate makes it easier to concentrate on God and the teachings of the Guru. At the Shri Guru Ravidas Temple langar is located next to the prayer hall in the Gurdwara. Like the prayer hall, the seating is on the floor but unlike the prayer hall, the men and the women are free to sit together. Each person takes a tray and sits down, and then volunteer member of the congregation called a Sevadar comes and serves the food. No meat is served in the meals of the langar. The members of the Sangat provide the provisions for the cooking, and families are designated to provide the food for specific weeks. 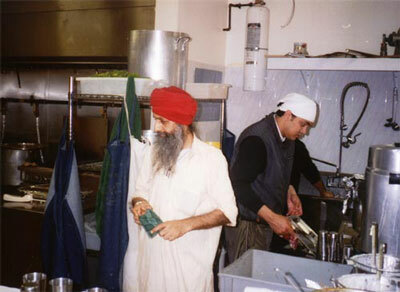 A member of the Sangat is chosen by the Sarbat committee to be in charge of the food. The cleaning is also done by various members of the Sangat. No preference is shown in who performs what duty, and no one is considered as 'above' duties such as cleaning or cooking. All members are equal and share equally in the responsibility which comes with the maintenance of the Gurdwara, including the langar. Unfortunately, because the Shri Guru Ravidas Temple has been so recently established, neither classes in religious education or the Punjabi language are offered. This is undoubtedly something the members of the Sangat will be interested in changing once they have had sufficient time to organize themselves. I was curious about the name of the Shri Guru Ravidas Temple, and decided to research it as part of my report. In my own experience, the name chosen for a house of worship can give valuable information about the affinities of the congregation. For example, the Baptist church I grew up in was named 'Calvary Community Church'; the name of the church indicative of the Baptist tendency to stress the Christian doctrine of Christ's atonement on Calvary. Bhagat Ravidas, the poet and mystic for whom the temple was named, was born in the fifteen century into a low-caste family. Very little has been discovered about Ravidas' personal life aside from that which he recorded in his writings, but it is known that he was born near the city of Varanasi. He joined the family trade of shoe-making and tanning hides and eventually built himself a thatched hut where he spent much of his time conversing with the travelling ascetics and saints. Ravidas came to be known for his simplicity and piety, as well as his impassioned devotion to one Supreme Being. A widely circulated story about Bhagat Ravidas is that Queen Jallibai presented him with expensive clothing and trinkets. Ravidas responded by telling the Queen that the name of God was more precious than that which she had given him. Ravidas was also a deeply compassionate man and gave a large part of his income to the poor and needy. He wrote spiritual poems of devotion to God, forty of which are included in the Guru Granth Sahib. He travelled widely and had many followers, including some from the higher castes. This is particularly significant as there is a strong emphasis in Ravidas' writing on the irrelevance of caste in the spiritual journey, and on the futility of ritual. Some Sikhs celebrate the birthday of Bhagat Ravidas, which is on February 27th. After my visit to the Gurdwara, it is clear that the message of the Gurus and of Ravidas is alive among the members. Although I was clearly unaccustomed to the practices of the Gurdwara, the members of the Sangat provided me with a head covering, patiently explained to me where to sit and later offered me food in the Langar. A feeling of warmth and acceptance emanates from the people of the Shri Guru Ravidas Temple, and I am grateful that I had the opportunity to meet them and observe worship in a Gurdwara firsthand.